Receive warm greetings in the name of the trinity; the Father, the Son and the Holy Spirit. 2016 has been quiet a hectic year. It came with a lot of challenges that needed us as both students and Christians in the Anglican Church to stand up and be vocal about a lot of things. As conquerors in the Lord, here we are in 2017, still standing strong with no doubt that God has gone before us and cleared the paths of 2017. We remember the soldiers in Christ that we lost last year; Thabiso Rafutho and Lungile Williams. May their souls continue resting in peace. Their contributions in the Church made a difference, however, God needed them more than we did and we believe they are at a better place. We continue to pray for Bonginkosi Khanyile who is still in jail as a result of the #Feesmustfall protest and we deeply commend his bravery to stand firm in what he believes in. Not forgetting every single student and priest who took part in this movement, to create peace and a safe protest. May we continue praying for God’s intervention in this matter and for His grace and mercy that is sufficient for all of us. To the fresh additions to our organisation, may God bless you on the new journey that you have just embarked on. May you feel the warmth and love that Anglican Students’ Societies bring, in your respective regions. This is an exciting journey and you have a ‘home away from home’ behind you, cheering you on to greater heights. The Provincial Executive Committee would like to wish everyone a blessed and fulfilling 2017. Greater opportunities await us in this New Year. 2016 was a year where we waited on the Lord but now He has renewed our strengths so we can soar high like Eagles, no matter what may come our way. This is the year of greatness, take charge. Welcome note From ASF President. Presidents welcome all the Members and friends of ASF. Brethren’s, fellow Students, Friends and the Clergy in the Anglican Church of Southern Africa, receive my greetings in the name of our Only Lord Saviour Jesus Christ, Amen. As we have bid farewell to the academic year 2015 and welcomed the academic year 2016, I would like, on behalf of the Provincial Executive Committee, to wish you a prosperous, peaceful and happy new year. At this time, I wish also to extend my best wishes to the Matric Class of 2015 that recently joined us in various institution s of higher learning more especially those who agreed to walk with us, following our calls during operation “abasazi” that took place in various campuses. I would like to assure all the NEW students of the warmth of the “Home away from home” in our various ANSOC’s. To the members at large, more especially the leadership, let us start this year committed to the mission and vision of our federation with renewed confidence in our roles as members and leaders, to ensure that the work of the Lord reaches or rather benefits all the students in Campuses, I then therefore wish to urge everyone (member/associate or a friends) to accelerate our efforts towards the realisation of our goals for bettering the lives of the students where we operate. We will also have to work effectively and tirelessly in ensuring that the projects and programmes as set on our various plans of action, intervenes to the challenges that are faced by the students in the institutions of higher learning, furthermore forge relations with all other stakeholders who are on the same mission as us. Let us be beacons of hope and agents of change in our various corners. Necessarily, let us draw relevant lessons from the past years and work twice as hard in ensuring growth of our beloved federation .I would like to retaliate the importance of involvement of friends in all our operations as the federation, similarly urge all friends to be of assistance in their respective region in pushing the Gospel Christ. ASF members, friends and associates of this gigantic organisation it gives me great pleasure to reflect and commend the work of Anglican Students’ Federation, for our short time in the office as the newly elected leadership of 2014-2015. I would like to start by paying tribute to all those members and friends who have passed away during this past year. Their presence will be dearly missed, our sincere condolences go to their families once again, may their souls rest in peace and rise in glory, hope they are watching over us and guiding our federation. The federation was celebrating its 54th year of existence in this year’s conference and 24 years after the liberation of our country which also was significant for ASF because it changed the federations focus because apartheid was no longer the binding factor; therefore the ministry had to continue in a new context and with new aims. Now the question that we have to ask ourselves is that are we still relevant as a student structure and are we carrying out the mission and vision of the federation in our respective ANSOC’s? It gives me great pleasure to see that our respective Regions are carrying out programs, which are a benchmark for other organisations because Ansoc is still the only Student Christian Organisation which doesn’t only focus on ministry but also focuses on issues which affect us as young people and students, that’s what makes us unique from the other organisations, but it is also our weakness, because we tend to focus less on the spiritual aspect of it all, and that is why we find our Ansoc’s losing membership to other structures as if we praise a less God then others. It is very painful when you find out that other ANSOC’s are just in universities by name, but no programs what so ever, but when it comes to conference every branch is represented by people. These are the many challenges which we face as an organisation, there can only be one solution to these challenges and that is to be honest to ourselves first and also accept and seek for help from those who have been there before us, and those who still have the love and passion for our federation. I put this as a challenge and call to all ASF friends to assist and mentor the second layer of leadership, Mark 3:14 reads as follows “Then He appointed twelve, that might be with him and that He might send them out to preach” Jesus welcomed people to come to Him for mentoring. He was and is the ultimate mentor. He developed imperfect humans to become effective leaders. Jesus did everything a mentor can do to enable the disciples to flourish in their personal lives and ministry. In Matthew 11:28-30, He says, “Take my yoke upon you and learn from me, for I am gentle and lowly in heart, and you will find rest for your souls. For my yoke fits perfectly, and the burden I give you is light.” In those days a yoke was used for oxen as they laboured in the field. The yoke He spoke of was designed to harness two oxen, a strong one and a weak one. The weaker of the two was present to learn what it meant to work in the field through “on the job” training from the stronger ox. Most of the weight was carried by the strong one until the development process was complete. This is the challenge we face in our Ansocs, leaders leave without mentoring and guiding the second layer of leaders, hence we find our Ansocs dead after certain individuals have left. This is a humble plea to all lovers of God and of ASF to work hand in hand and grow our beloved federation. This year we are also facing many challenges in our different institutions, there increasing amounts of strikes in our Universities; it is evident that the devil is targeting young people, and this affects ASF directly because it’s the futures of our members that are on the line. This is a test of time, and our faith, and we must stand firm in our faith and pray until something happens. Nearly every moment of life is a test; however there are seasons of testing that can be identified, understood and passed if we are alert. When God tests us, He takes us through a crucial screening which reveals what they are made of. Passing the test is the pathway to progress. Therefore in these difficult times let us pray for each other and let’s not forget to pray for our brothers and sisters in Christ in Lesotho. As the PEC we are always willing to be of any assistance to each and every Ansoc that is in need, as we are trying to create an Ansoc for our brothers, sisters and children which will still exist for another 54 years, and all evil spirit that try to stop us from achieving this, will not prosper. As God is on our side, the devil shall sweat when it stands on our way. God bless Africa, God bless ASF, and God bless you all. Greetings my fellow Anglicans: Following a series of threats, defiant statements and the kidnapping of girls by Boko Haram, the presence of African and Christian solidarity is required in the Federal Republic of Nigeria to carry out the final and unequivocal order of the entire African continent. The kidnapping of more than 200 girls by Boko Haram last month has shocked the world, but many Nigerian villagers have been enduring deadly attacks for a year or longer. Thousands have fled across the borders to the neighbouring Cameroon or Chad, or southward to the capital, Abuja. The statistics are horrific, 147 Christians have been killed in the past year, 87 churches have been torched, and 56 villages have been emptied of all Christians and close to 15,000 people have been forced to flee. The war with Boko Haram has killed close to 12,000 citizens of the Federal Republic of Nigeria; surely any noble Christian and Africans at large, regardless of where he/she lives, should be worried by this statistics, if not, we will have to stop and examine our conscience about this and other related incidents affecting our continent. This continent was founded by men of many nations and backgrounds. It was founded on the principle that all men are created equal irrespective of their religious believes, and that the rights of every man are diminished when the rights of one man are threatened. Today we are committed to a worldwide struggle as the Anglican Students Federation to promote and protect the rights of all who wish to be free more so as Christians. It ought to be possible, therefore, for Nigerian girls of any religion to attend school without having to be backed up by troops. It ought to be possible for those poor Nigerian Christian girls to receive equal treatment without interference or fear of reprisal. It ought to be possible, in short, for every African to enjoy the privileges of being an African without regard to his/her religious affiliation. In short, every African ought to have the right to be treated as he/she would wish to be treated, as one would wish his/her children to be treated. But this is not the case. A Christian girl in Nigeria, regardless of the choice of religious affiliation, ought to have as much chance of completing a high school as a Muslim girl in the same place on the same day, as much chance of completing college, and as much chance of becoming a professional woman. This is not a just a Nigerian issue. Difficulties over segregation and discrimination over the choice or inheritance of religious status exist in other sections of our continent, rising tide of discontent that threatens the continental safety. It is a time of domestic crisis and men of good will and generosity in Africa should be able to unite regardless of their religious affiliation. This is not a Nigerian issue alone. It is better to settle these matters in the peaceful negotiations because war alone cannot make men see right. We are confronted primarily with a moral issue as Africans. We face, therefore, a moral crisis as a continent and as a people. It is a time to act as Africans, in our countries and our regions and, above all, in all of our daily lives. It is not enough for our leaders to just talk, they must act. A great change is at hand, and our task, our obligation as Christians, is to pray for the softening of hearts and attitudes to those who are directly involved in this crisis, pray for the families of those girls and importantly, pray for their safe return to their respective homes. IF AFRICA CANNOT PUT AN END TO TERRORISM, TERRORISM WILL PUT AN END TO AFRICAN. AFRICA UNITE!!!! I have no doubt that the God we all pray has been good to us all and most importantly to our beloved federation. We continue to give thanks to the Lord for the precious gift of humanity and the present composition of our human element, the wonderful warm people of our federation. The first half of the term of office 2013-2014 is coming to an end and when one looks down the memory lane from where we were in nearly 8 months ago to where we are, a great deal of work has been done. When the Provincial Executive Committee (PEC) met for its first joined sitting, on the 30th August 2013 to 1st September 2013, a crucial question was posed, “What are we planning to do for this term of office?”, after a lot of ideas had been bounced in the air, we all agreed that we would put our emphasis on leadership and unity through intensive training and development of the leadership within the An’socs , Anglicanism through more involvement of the chaplains and the rejuvenation of dead and establishment of new An’Socs. Accordingly I would like to take this opportunity to thank the PEC and the REC’s (Regional Executive Committees) for the hard work done and inform the ASF family on the progress being done. Among other things, and central to the work of the PEC, we have been able to solve the problems of leadership in the Limpopo region, where there was no REC. The region had elected the regional task team, which was initially formed in the absence of a quorum to elect the regional executive. The work of this task team was to first act as the REC and second to rejuvenate UNIVEN An’Soc (University of Venda) but it failed on both tasks which made it difficult for a smooth transition between the PEC and the region since the BEC in charge then was also not co-operative. Confronted by the reality that as the PEC we had to take charge for the betterment of the region, we advised the region on its joined sitting to elect one executive committee that would function both as the REC and the BEC since Limpopo region has only one active branch and to avoid two centers of power which had proven to be a serious problem within that region. In this regard I would like to sincerely thank the Limpopo region for the work that has been done thus far and it is my prayer that the beginning of 2014 will see UNIVEN as a member of our federation again. We have been privileged to visit the region of KZN where a very successful regional conference was held and of importance to note was the involvement of the clergy which assisted most significantly on the success of the conference. We also went to the Western Cape region for the gala dinner which lived up to the expectations. The saddest moment of that weekend however was when the ASF and the whole Anglican Church had to bid farewell to Mr John Nongalaza who was so integral to the whole Church and importantly to the ASF. Mr Nongalaza played a pivotal role in the life of CPUT Cape Town An’Soc and to the entire ASF particularly in the previous conference of Kroonstad. We therefore thank Mr Nongalaza for the resources, time and his energy he spared for the benefit of students. (Mr John Nongalaza has since joined the Ethiopian Church for personal reasons). where they also get airtime on the national radio and they are able to make funds through the project they are currently running. For a number of years we have been struggling to break through into Mpumalanga. Indeed through the hard work of the PEC and the GP-MP leadership and some very dedicated members of that region, we have been able to break through into Mpumalanga however difficult it was. A steady progress has been made, the leadership of the region and the PEC went to the satellite campus of the Tshwane University of Technology at Emalahleni which has over 2000 registered students and hope is that by the beginning of the academic year of 2014, we will be able to recruit members to join An’Soc. We have also worked continuously to ensure that we create a healthy relationship with the management of the new Nation Institution for Higher Education (NIHE) in Siyabuswa so that by the start of the academic year of 2014, we become one of the first if not the very first religious structure to register on that institution. We have met with the campus director who has given us the opportunity to go to the campus and recruit members during their orientation which is scheduled for the 26th and the 27th of January of 2014. We have sought to advance this vision precisely to ensure that we are represented in every part of our Province (ACSA) and it is our prayer that God also give us the carriage to branch into Northern Cape before the end of this term of office. Despite the promising outcomes we have seen and even as we ensured consistent results in our activities in most of the regions, we have far greater challenges in ensuring that consistent growth within our federation both spiritually and morally becomes a permanent feature of lives. Numerically also we are faced with enormous challenges in the regions of Free State, North West, Swaziland and Mozambique. We therefore need to work continuously to combat these challenges and continue more so to strengthen and improve the functioning our An’Socs within the regions. Indeed the hard work that we have done in pursuit of our vision and mission as the federation has had its challenges and I refer particularly in this regard to the strike actions that have hit hard on both the University of Swaziland and the Walter Sisulu University (WSU) earlier this year. Many shall recall that on the 21st August of 2013, the South African Council of Churches (SACC) and a host of political and traditional leaders met with the WSU community and students at Mthatha and wrote a memorandum to the state president of South Africa asking him to intervene on the WSU issue. The matter was resolved and classes commenced. On the interim, the decision was taken that for the time lost by the students as a result of a strike, classes would be provided for students during the weekends to cover up the syllabus. Automatically the examinations started late on the 29th November of 2013 and scheduled to end on the 19th December of 2013 of which 20th December the University closes. This catch-up plan will continue until the 17th January 2014 during the issuing of results. Consistent with our common practice, in about six months’ time from date, we will be hosting our 54th Provincial conference scheduled for the end of June in the region of Namibia as per the resolution of the elective conference of Kroonstad in the Free State. I therefore urge all of you to start making preparations financially and I want to especially make a call to those who are without the travelling documents to start applying to avoid doing things at the last minutes. our conduct in the provincial conference is concerned. It is my prayer that the beginning of 2014 shall bring a new “US” necessarily to ensure that we leave a lasting legacy, a legacy that we shall all be proud of and never to be ashamed of when we have left this immaculate federation. We are now in the month of December where the world AIDS day is celebrated (1st December). While most of our regions are unable to commemorate this day because of our academic calendars, the fact that we see this day as the federation gives us a rare opportunity to co-operate as Christian’s in addressing this pressing problem. This pandemic is spreading despite the advances made by the world governments to eradicate it. There are positive outcomes though as per statistics by UNAIDS, but this fruits are yet to be fully and equitably shared by the people hence we see the abject HIV coexisting side by side with extra ordinary opulence. But the public awareness around HIV/AIDS is needed today; not tomorrow. The challenge today, to the youth and adults alike, is to make lifestyle choices which help to combat this epidemic. Therefore this month I would like to bring the message of tolerance and support, as the federation which is part of the Christian community and as individuals, we need to treat friends, relatives and other compatriots who are infected with compassion, this applies more so to orphans and infected children. The campaign for HIV/AIDS is the task for us all – young and old. AIDS knows no custom, it knows no colour and it has no boundaries. We have to work together wherever we are to preserve our federation, our respective countries and humanity as a whole. We are fast approaching the Christmas holidays, a time for celebrating with our loved ones and sharing with those who do not have. At the same time we all know that Christmas is not only a time for festive cheer, but as noble Christians, we all know what it means to us. During this festive season, I call upon every ASF member to make a humble contribution and land a hand to those individuals and families that are unable to support themselves and to show compassion to children that do not have clothes, something to eat or to give them a simple gift that will bring smiles to their faces. It is through caring for the most vulnerable members of our society that we can save and care for the souls of our countries. I am fully aware that at this point in time, there are institutions that are engaged in examinations and I want to take this opportunity to wish them all the best and this applies equally to all those who have completed their exams. Accordingly I want to make a plea for consciousness of road safety; we all know our roads are a lethal weapon especially around this time of the year so I want to appeal to all road users to hid regulations meant for their safety. to those who do not have. On behalf of the PEC, I wish you a merry Christmas and a prosperous new year. Yesterday 05th December 2013 the sad news was confirmed that South Africa’s most revered citizen, Dr Rolihlahla Nelson Mandela, has passed away at the age of 95. Mandela, one of the most highly respected individuals around the world, did more for South Africa as a country than words can possibly describe, including playing a major role in the renaissance of Africa. Mandela shall surely be remembered as an icon for reconciliation and a humble soul that had so much respect for humanity, a principle he lived for and never compromised. The Anglican Students Federation, like every other society in South Africa and the world, have been hurt hard by the news of his passing and wish to sincerely send our heartfelt condolences to his family and all the people whose lives his work has benefited. The sad news is not just a blow to South Africa, but to the whole world, a world that has lost one of its best creations. May he rest in peace, his memories will never grow old. GREETINGS IN THE WONDERFUL NAME OF GOD THE FATHER, SON AND HOLY SPIRIT. We greet you as the Provincial Executive Committee of the Anglican Student Federation and we hope all is still well in our An’socs and Regions, the PEC elected at the Kroonstad Conference will quarterly give a brief report of what is transpiring in the term of leadership. Since our election into leadership we are finishing the first quarter on the 30th of September 2013. A lot has been happening and we want to alert our branches of what is happening. These are activities that transpired in this first quarter! Immediately after our Provincial conference in Kroonstad from the 23rd to the 28thth of July 2013, the PEC was represented by Mr Tshepo Mokoka, the ASF Organiser at PYC meeting held in Lesotho Region. The PYC was from the 4th to the 7th of July 2013. The Organiser was invited to represent to the PYC about ASF objectives, mission and vision. The KZN Region REC 2012/2013 did not manage to hold its regional conference in the eve of Regional Conferences between February and May 2013. The Regional Executive was engaged on many occasions in ensuring that they elect before the Provincial Conference in ensuring that they will have a representative in the PEC but that did not happen. The Regional Executive with the help of Nkosiyazi Zungu organised a Regional Conference on the 24th of August 2013. On the 24th of August the President Mr. Rethabile Matlatsa together with Mr. Tshepo Mokoka, the ASF Organiser managed to attend the Regional Conference of KZN and assisted with the AGM. The new leadership was elected and a workshop on Anglicanism was rendered by Reverend Siyabulela Gidi, hopefully KZN will be back in its feet again under the leadership of Gumede Sbusiso (elected chairperson). 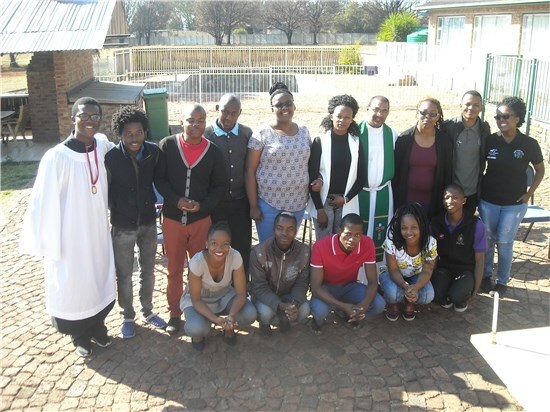 On the 30th to the 1st of September 2013 the PEC met in Benoni at Diocesan Offices of Highveld for the PEC meeting 1 where the ASF office is based. PEC members had the opportunity to see the day to day running of ASF as they saw the office. All the PEC members where present it’s only the region of Limpopo which was not represented. A lot was deliberated upon, the regions presented their POA’s and advises and changes where done to some POA’s. The PEC also managed to draw its own POA guided by the state of regions and the need for some projects to be done. The PEC mandated Regional Chairpersons to report to their respective regions after the PEC. In general from October on wards most regional activities are not that much as compared to the third quarter of our term of office. The PEC meeting went very well and An’socs should demand a clear PEC report from their Regional Chairpersons. During the Regional Conference eve in the term of office 2012/2013 the Regional Conference of Limpopo did not corate and they appointed a Regional Task Team. It was reported to the PEC that the RTT is not functional. The PEC decided to task the Organiser and the President to visit the Region of Limpopo to try find solutions to the problems in Limpopo. After lengthy discussions with members of the region the PEC and the An’soc members of Limpopo Region decided to disband the RTT and both the BEC to have one structure that will act as both the REC and BEC of Limpopo Region. The BEC/REC is now led by Miss TebatsoTeefo. A clear report was sent to both the disbanded structures as most members of those structures where not there especially key portfolio holders. An induction workshop was also conducted to the newly elected BEC/REC of the Region of Limpopo. As part of the POA of the PEC the Organiser was tasked with the provincial chaplain Revd. A Mathe to have a meeting with Bishop Steve of the diocese of Johannesburg on the 10th of September 2013, the meeting was to request the Bishop to assist An’soc UJ and Wits with Chaplains as they currently don’t have chaplains. The meeting went very well and the Bishop promised that something will be done after consulting with his chapter. It is with great pleasure as the General Secretary to be reporting to the An’socs and Regions in the term of office 2013/2014. As we can all see a lot is being done it is also our hope that at regional level programs are continuing as planned. It is sad that attached you will only find a reports from Swaziland and North West this is due to our Regional Chairpersons who did not send in their quarterly reports in time with the aid of their regional secretaries. We hope in the second quarterly report all Regional Chairpersons with the help of their regional secretaries will send their reports in time. For any information don’t hesitate to call the office of ASF or the General Secretary at the given contact details. Successful at all branches except SCOT branch faced with challenges of the opening date for each academic year was in phases. 10% of current membership recruited on this week long operation. Greetings to you all fellow brothers and Sisters in Christ. For more information please don't hesitate to contact the&nbsp;ASF&nbsp;Regional Chairperson of Eastern Cape Mr. Viwe Mdunyelwa @ 0781750311 . The Anglican Students Federation is joining political parties and other stake holders in higher education for further intervention at Walter Sisulu University in the Eastern Cape, which has closed indefinitely amid labour and student unrest. Students at the institution’s four campuses were given until midday on Wednesday (28th August) to vacate the premises because of the discord that has characterized the life of that university. The closure follows a five-week-long strike by staff demanding higher wages that has all but ended teaching and learning which also began leading to disruptive student protests. The ASF wishes to express its unequivocal support to the students of Walter Sisilu University for protesting against the injustices demonstrated to proper education. The actions of the students to protect the core values of education and academic freedom are timely, important, and admirable. We strongly condemn the victimisation of students who participated in the strike and plead with the university that the tyrannical orders for the closing of all of the campuses should be withdrawn and the university be reopened at once. This support however is not confined to negative acts of passivity, we condemn once more any sort of violence that has characterised the protest march which to our understanding was meant to be a peaceful demonstration. We know and greatly applaud the patience the students, whose futures have been put at risk, have shown but vandalizing the property of the institution is a recipe for another disaster which none of us would want to witness. In its positive form it expresses itself in desperate attempts pray with and for the university in its entirerity to find a common ground to deal with the fundamental issues at hand so that the business of the institution can continue. We therefore call on the supremacy of the university to seek the views and obtain the express consent of the students necessarily to ensure that the future of students is not been compromised, this is a dynamic demand by the students which should never be ignored. The Bible tells us that the gospel frees us from slavery to sin and prepares for us ‘an inheritance that can never perish, spoil or fade’ (1 Peter 1:4). However, there is a cost to be counted. As Jesustells his disciples in Matthew 10:22, ‘All men will hate you because of me, but he who stands firm to the end will be saved’. You might ask, why is it so hard for Anglican students or rather Christian students in general to stand firm in thegospel? After all, Christian witness is rarely easy and often brings opposition, aggression andpersecution to believers at all levels of the Church and at all stages of life – why then single outstudents? Many Anglican students who profess faith find themselves at a crossroads during their universityyears, where it becomes clear that they cannot live with one foot in the World and one in theChurch. As Christ himself says, ‘No one can serve two masters. Either he will hate the one and love the other, or he will be devoted to the one and despise the other’ (Matthew 6:24). This article is notintended to make excuses for those who choose the World over Christ, nor to justify any lack ofactivity thereof on the part of Christian students. It is my hope that those reading will gain a betterunderstanding of the pressures faced by Anglican students in today’s universities, and that this willequip them to support and pray for student ministries across our countries. The contents are based onpersonal observations during my time as a full-time student, and I am more than happy and certain to concede that theymay not represent every student’s experience. Students are generally thought to be open-minded and tolerant, but university can be a hostile environment for the young Anglicans. For one thing, there tends to be a pre-occupation with drunkenness and sexual promiscuity, both minefields for Christians who may not yet be adept at battling temptation in these areas. Furthermore, it can just be rather embarrassing to admit to others that yes, you happen to be a Christian. No, you don’t wear socks and sandals, or bash passers-by with your Bible, or have a fixation with tambourines, but there is usually an awkward silence to fill after you admit your faith to fellow students for the first time. Very few people would openly remonstrate you for your beliefs, but in an arena where popularity and public opinion is of paramount importance, and where being a Christian is about the least ‘cool’ thing you can do, it is perhaps not difficult to understand why some Anglican fresher’s balk at the notion and resign themselves to undercover Christianity for at least the first few weeks of university life. This is often a perilous path however, as Anglicans who don’t prioritise getting involved in their Anglican Societies (An’Socs) or local churches do very often struggle to put Christ first for the rest of their first year, or even the rest of their time as students. Likewise, it can be easy to find reasons not to go to your Hall’s small group Bible study, to An’soc prayer meetings, or even to church once your workload starts to pile up and friends from your course want to know why you don’t want to go out drinking on a Saturday night. Lunchbars where an outside speaker will tackle a particular apologetic issue and take questions. Cold Contact which involves talking to passers-by on campus and trying to start up gospel conversations. Christianity Explored courses where particular questions can be discussed in groups facilitated by a leader. Events organised in halls of residence that can be tailored to fit the specific needs of the people expected to come. Spiritual revivals that have always proven to be our strongest point as Anglicans. However, there is also a big emphasis on personal evangelism, which can often be more effective than inviting people to events. The benefit of personal evangelism, whilst time-consuming, confrontational and often more of a long term investment is that it enables us to reach people who might not otherwise come into contact with Christians or a local church. An’Socs are usually comprised of people doing a broad range of courses and extra-curricular activities, and who live in a variety of areas on and off campus, and equipping these Christians to witness to their friends, course mates and neighbours can prove fruitful for the gospel. It is easy to gain the impression that there are no mature Anglicans in our universities whatsoever, yet this is by no means an accurate portrayal of the situation. One thing that is hugely evident in many An’Socs is the work of the Holy Spirit in the hearts of those who follow Christ. One of the greatest privileges of having fellowship with An’Soc members is seeing the level of spiritual growth in individuals between the first and final years of university. Some students arrive at university having never come to faith, yet are hard at work for the gospel by the time they reach graduation. And in many ways, it is not difficult to flourish spiritually as a student. Many young people’s lives and hearts are changed through faithful teaching of the Word, and An’Socs or church-run discipleship programmes such as one-to-one prayer and Bible reading with older Christians ensure that disciplines such as accountability and personal Bible study are learnt and practiced regularly. Simply being a member of a particular An’Soc can be a great encouragement as there is a real focus on evangelism, and usually quite a few people to do it with. As a result, graduates can find it a bit of a shock when they leave university and perhaps enter a job where they are the only Christian in their workplace. Many churches are actively involved in evangelism in a number of different fields, but some focus more on discipleship and Christian living compared to the An’Socs who meet up to evangelise, pray for evangelism, discuss evangelism, or encourage evangelism. Unless graduates ensure that they involve themselves in church activities it can be easy to lose the sense of urgency you had when you were a student. While available to those who take the initiative and ask, regular and personal accountability are not centrally organised in a lot of churches, and for ex-students who have been used to meeting up with an older Christian on a weekly basis, it can be difficult to maintain spiritual growth. There is a general reluctance among non-Christian students to engage with or encourage evangelistic activity, in the same way that members of the public will often give Street Evangelists a wide berth and avoid eye contact where possible! However, when compared to countries across the world where even preaching the gospel is illegal and brings severe persecution to believers such as violence, imprisonment and even death, the students in this Province (ACSA) have relatively little to fear. One of the hardest things for younger Christians can be overcoming peer pressure and being willing to stand out as being different. It is not easy to take the initial leap of faith required, but for anyone who has shunned the standards of the world in order to take up his cross with Christ; it is of immeasurable worth and eternal value. In the words of the late Jim Elliot, ‘He is no fool who gives what he cannot keep to gain that which he cannot lose’. To conclude, I would encourage you to pray for Christian students and put especially more emphasis on our own Anglicans as they seek to live and speak for Jesus on university campuses across the province. It has been a great encouragement to me personally to have spent time working alongside fellow Christian students, and to witness the saving and sanctifying power of God’s grace at work in the lives of those around me. However, there are many pressures on young Christians to conform to the values set by the world, and they greatly need your support and encouragement as they stand firm in the faith. This article has been compiled by Rethabile P Matlatsa (52nd Anglican Students Federation president) for new comers in the life of university. Recruitment is a process that should not be taken for granted. It is done in order to grow and sustain the federation for future leaders. ASF has been in existence for almost 57 years and we wish for it to succeed for many more years, shaping spiritual leaders for our country. To the fresh additions to our organisation, may God bless you on the new journey that you have just embarked on. May you feel the warmth and love that Anglican Students’ Societies bring, in your respective regions. This is an exciting journey and you have a ‘home away from home’ behind you, cheering you on to greater heights.